It is the third leg and is 6 kilometres long with a height difference of 320 metres. The highest point is 760 metres high on Mount Capri. Completion time is 2 hours. The path is immersed in the bush and pinewoods up to the Bivio Bramapane, where a dirt track along the coast side of Mount Verrugoli (741 metres high) leads, through chestnut trees, to Monte Grosso (665 metres high) and Sella della Croce (637 metres high) where there is a path that descends to Riomaggiore. 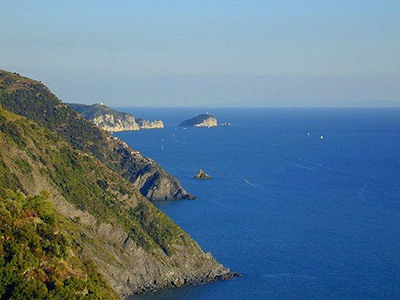 One climbs up the ridge towards Monte Galera (726 metres) and meets the path that descends to Manarola, continues up to Monte Capri (785 metres high). Taking a 50 metre detour, one can observe the Cinque Terre menhir, which was originally 3.8 metres high but has now toppled over and is broken into two (its original use is still a mystery). The walk proceeds beneath the ridge, through chestnut trees, till one reaches Monte Marvede (666 metres high).